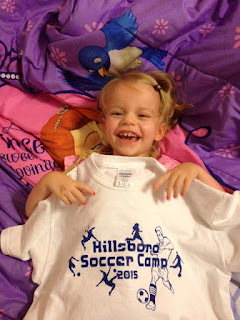 Saturday's trip down to the Hillsboro Sports Association's soccer camp just happened to be more than the usual assignment. Jim White had contacted Kyle on Friday to see if we would be able to bring Grace by on the final day of the camp as the Sports Association had decided to donate 20 percent of this year's camp proceeds to the INAD study for Grace. Grace is SO excited about her new soccer camp T-shirt! In her brand new stroller, we headed down to the Sports Complex on Friday, where 60 or so youngsters were running around on the soccer fields. Jim White and Matt Lentz (president of the Hillsboro Sports Association) gave Kyle a check for more than $225 for the study. Jim also gave Kyle some more of the proceeds from the sale of the vuvuzelas (blue horns). It was such a neat experience, and our donation for the research study at Washington University continues to grow. For me, the best part of the morning was when we were lining the kids up to take a photo with Grace. One little girl and her dad were walking onto the field, and her dad said, "see over there, that's Grace Herschelman." And the little girl was SO excited. It was almost like she was getting to meet a movie star. She even let Grace borrow her sunglasses for the photo. And I had a little trouble lining up the photo because all the kids wanted to be right next to Grace. All these kids are part of a winning team for their help in supporting INAD. It was such a sweet day, and we are so grateful to everyone who made it possible.